TULSA - Board members for Tulsa Public Schools will hear a proposal to consolidate two north Tulsa schools to make up one elementary. The change is causing some teachers concern for their students and their classes. 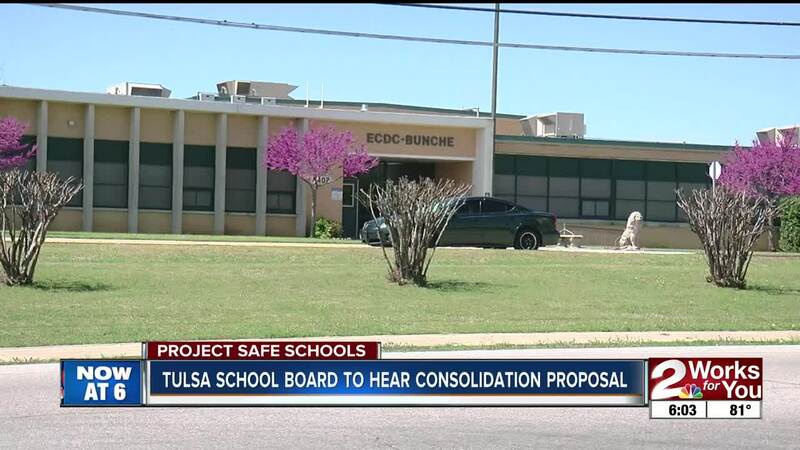 Superintendent of Tulsa Public Schools is presenting a plan to consolidate Gilcrease Elementary and Bunche Early Childhood Development Center, which sit next to each other at 56th Street North and Martin Luther King Jr. Boulevard. If that happens, Chief Operations Officer Jorge Robles said all pre-kindergarten through fifth grade will be housed at ECDC Bunche. He said this will make it easier on the students by eliminating the transition from early childhood to grades 1-5. Robles the change will also be better for taxpayers, since only 53 percent of the building at Gilcrease and 26 percent at ECDC Bunche is occupied. Robles also adds the ECDC Bunche building is much better suited for elementary students. “We’re really focused on creating the best environment for our kids and we know that research shows minimizing transitions for kids is really important to create stronger academic success," Robles said. However, some Gilcrease teachers are worried about the new plan and said there hasn’t been enough planning time for a smooth transition. “We’re not necessarily against consolidating the schools together at some point, but at the point where we are in the year, we don’t feel like there’s adequate time to prepare for this, to prepare our students and the building," said Nicole Powell. Two friends and teachers at Gilcrease, Hanna Al-Jibouri and Powell created a mulitgrade class last year for third-graders who had been retained and their previous classmates in the fourth. “We take a test beginning, middle and end of every year and our mid year scores, most of them were over 100 percent of growth met for the end of the year," Powell said. Al-Jibouri and Powell are concerned the new move would make it tougher for their students who are just starting to get on the right track. "My commitment to these students and community and this district is there and we don’t want anyone to think we are fighting against the district or fighting against the board of education," Al-Jibouri said. "We are just so passionate about what we feel the students deserve." TPS has conducted multiple walk throughs to make sure the building can accommodate the new grades and classes, including Al-Jibouri and Powell multigrade class. “We found a space actually that we’re going to do some remodeling to make sure the space to the actual square footage is comparable so they can house all of their activities,” Robles said. If the proposal passes, sixth-graders at Gilcrease will move to the new Monroe Middle School and the rest of the students will start at ECDC Bunche this August.